As a test pilot, Joe H. Engle made 16 flights in the X-15 rocket plane and qualified as a Military astronaut before he became a NASA astronaut and flew two Space Shuttle missions. In 1981, he commanded the second flight of Columbia, the first manned orbital spacecraft to be reflown in space, and in 1985 he commanded a five-man crew on the 20th shuttle flight, a satellite deploy and repair mission. Engle was born in Dickinson County, Kan. in 1932, and earned a Bachelor of Science degree in aeronautical engineering from the University of Kansas in 1955. At the university he received his commission in the Air Force through the AFROTC Program and entered flying school in 1957. He is a graduate of the USAF Experimental Test Pilot School and the Aerospace Research Pilot School. From 1963 to 1966, Engle was a test pilot in the X-15 research program at Edwards AFB, Calif. Three of his 16 X-15 flights exceeded 50 miles in altitude and as a result he became the youngest pilot to qualify as an astronaut. In 1966, NASA selected Engle to join its astronaut corps. After serving as a backup crewman in the Apollo program, he served as commander of one of two crews that flew several Space Shuttle Approach and Landing Test flights in 1977. In these tests, the orbiter Enterprise was carried to 25,000 feet bolted on top of a Boeing 747 carrier aircraft and then released for its two-minute glide flight to a landing in the California desert. Engle commanded the second flight of Space Shuttle Columbia, blasting off November 12, 1981, with pilot Richard Truly in the first spaceship to return to orbit. Despite a mission shortened from five days to two because of a failed fuel cell, the astronauts completed 90% of the test flight objectives. 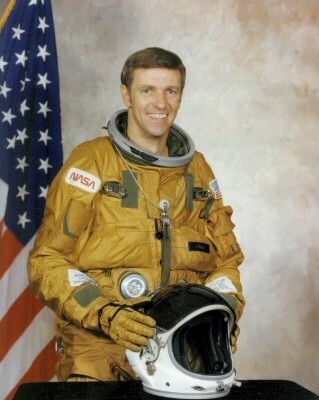 On this flight, Engle performed manual flight test data maneuvers throughout the re-entry and became the only pilot to manually fly a vehicle from Mach 25 in space to touchdown. Engle served as Deputy Associate Administrator for Manned Space Flight at NASA Headquarters for eight months in 1982, then returned to flight status. He was at the helm of the 20th shuttle mission that launched August 27, 1985, with a crew of five. During a week in orbit, the astronauts released three communications satellites, and performed the first successful in-orbit rendezvous and repair of an older, ailing Syncom communications satellite. Engle left NASA and became Air National Guard Assistant to the commander, U.S. Space Command. He is a retired major general in the Air National Guard/U.S. Air Force. Engle was inducted into the U.S. Astronaut Hall of Fame on November 10, 2001.